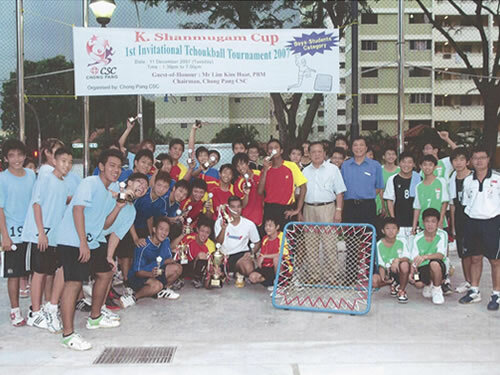 Organised by Chong Pang Constituency Sports Club on 11 & 30 Dec 07, this invitational tchoukball tournament took place at Chong Pang Community Club. 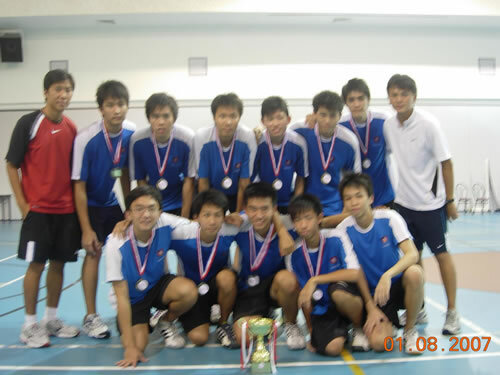 Congratulations to Ping Yi Secondary School who won the tournament. TBAS is organizing the above workshop on 10 Dec (Monday). Please register by emailing your name and contact details to contactus@tchoukball.org.sg by 5 Dec.
TBAS is organizing the above clinic on 19-20 Nov from 1-5pm for students who have learnt Tchoukball and would like to improve their skills. The cost is $12 and all participants will get a dri-fit shirt (worth $10). 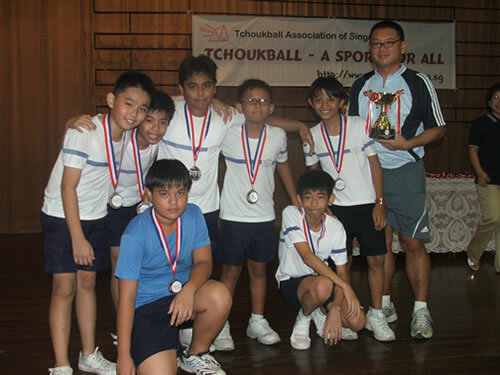 If you are interested, please email us your name, contact number and school to contactus@tchoukball.org.sg. Hurry! The clinic is limited to the first 50 participants. The Schools National Tchoukball Championship 2007 will be held on the following dates. 8 schools will be sending in a total of 18 teams to take part in the various categories. Mr Henry Tan, Assistant Director, CCA Sports, CCAB, Ministry of Education and Mr Ho Mun Wai, Director, Sports Management & Development Group, Singapore Sports Council will be our Guests of Honours gracing these occasions on 16 & 17 Oct respectively. If you are interested, please email US for more information. If you have a Facebook account, we encourage you to join our group there to be updated on tchoukball news. FITB will be organizing the below certification courses for coaches and referees during the above tournament. If you are interested, kindly email us at contactus@tchoukball.org.sg to request for the application form. The Tchoukball episode of “Little Coach” will premiere on Kids Central at 1.30 pm, 27 October (Saturday). Do tune in to see our young national player, Timothy teaching the show host how to play Tchoukball! TBAS partnered South Zone Primary School Sport Council (SZPSSC) to organize the above event on Saturday, 15 Sep at Pei Tong Primary School from 8am to 1pm. A total of 13 primary schools signed up and went through 3-4 sessions of tchoukball training for their selected players. The list of primary schools involved are Ai Tong, Hong Wen, Marymount Convent, New Town, Pei Tong, Zhong Hua, River Valley, Kheng Cheng, Cedar, Pei Chun, Radin Mas, Jing Shan, Zhang De. Congratulations to New Town Primary and Marymount Convent for winning the Boys and Girls categories respectively. Please click HERE for the results. Girls Category Winner – Marymount Convent. The above event took place in Malacca from 24-26 Aug 07. Singapore sent 2 teams for the Men category and 1 team for the Women category. The Women’s team came in 2nd and the Men’s team finished in 3rd in their respective categories. You may click HERE for the MTO results. The above event was held at Praisehaven Indoor Sports Hall on 1st Aug. Congratulation to Nanyang Junior College for winning this inaugural championship ! We look forward to even more JC’s participation next year. More photos can be found at HERE. Nearly 90 youth players turned up to represent their teams in the above tournament. Teams came from youth centres, constituency sports clubs and various secondary schools and junior colleges. Please click HERE to see more photos and results. The event is also covered by youth.sg. Click HERE to check it out! Congratulations to Fiery Warriors and YDC Girls for coming in as champions in their respective categories. Tchoukball is featured in this short video clip at the 1min 3 sec mark. Please click HERE to have a look at the scale and size of World Games 2009.
registered for this event. Click HERE for more information. 2) The Schools National Tchoukball Championship 2007 will be held on the following dates. 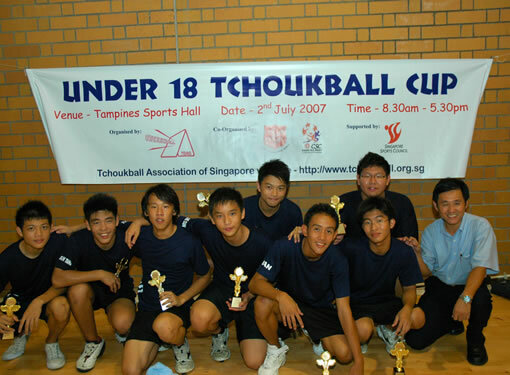 3) A Tchoukball Open League is being planned for Nov-Dec 2007. The Sports Education Programme (SEP) is a collaborative partnership between Singapore Sports Council (SSC) and the Ministry of Education (MOE). They will be giving $10,000 in matching funding to any interested schools who wish to have tchoukball programme in their school. Click HERE to find out more about SEP on the SSC's website. The programme code for our "Learn To Play" School Workshop is 0531. Click HERE to find out more ! 33 players have been shortlisted for the national team selection for the Malaysia Tchoukball Open (MTO). Please click HERE for more info. Kaohsiung Organising Committee (KOC) for the World Games 09 will be organising this event from 9-11 Nov this year. Singapore will be sending Men's & Women's teams to participate and prepare for next year's qualifier for World Games 2009. 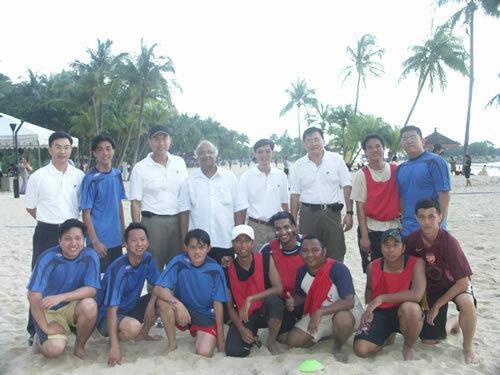 The top two asian teams will qualify for the Tchoukball event in the World Games 2009. Please click HERE for information on World Games 09. The World Games are held under the auspices of the International World Games Association (IWGA), and comes under the patronage of the International Olympic Committee. Click HERE to read more. We have added a new page "Articles" under the TBAS link above. There you will be able to read local media articles on the growth of Tchoukball in Singapore. Check out the latest article on Tchoukball from the April issue of Time Out Singapore magazine! Singapore's First Public Tchoukball Court! 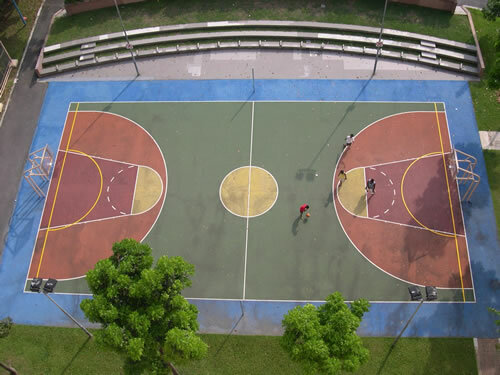 TBAS is proud to announce the location of the first ever public tchoukball court, located at Kallang Bahru estate. Check out the yellow painted lines for tchoukball. Thank you, Jalan Besar Town Council for your help ! The D Division, Singapore Police Force organised a Beach Party & Sports Fiesta for their personnel on 14 Mar at Siloso Beach, Sentosa. Beach tchoukball was one of the 3 beach sports featured and 10 teams signed up to take part. TBAS provided officials for the event. Congrats to team GISS and team P.I.T.A for coming in as Champion and Runner-Up respectively. If you are interested to learn to play Tchoukball, TBAS is partnering Braddell Heights YEC to organise these clinics 9am - 11am every Saturday in the month of March. Come on down and try it out ! It's FREE and we will be most glad to share with you. For travelling directions, please click HERE. Singapore will be sending a contingent of 32 players and officials to take part in the above event on 3 & 4 Mar. We have a total of 1 Men's team, 1 Women's team and 2 Youths teams to take part in 3 of the categories. 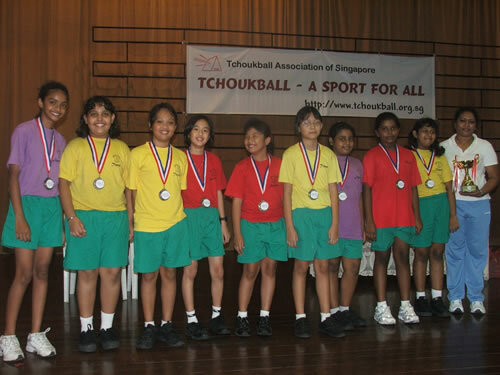 TBAS hosted our very first international Tchoukball event on 3 & 4 Feb 2007. Please click HERE for the results.